After my first experience building the Peltier cooled TouCam Pro II camera, I decided to see if it could be improved. 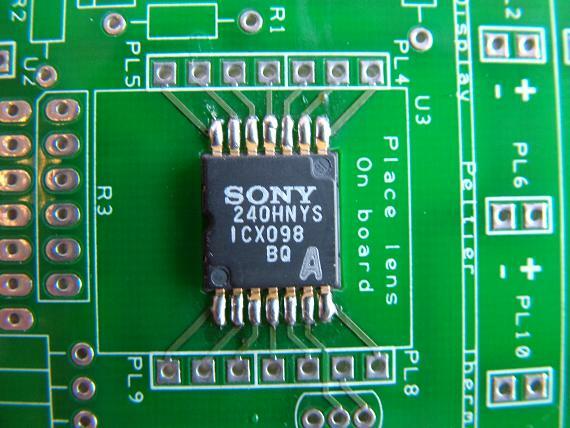 The new camera has a custom designed PCB, which holds the CCD directly, has the LX modification components on board, and includes the amp-off circuit as well. 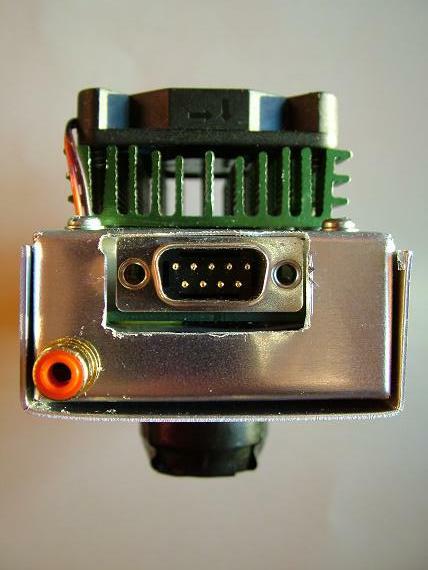 A nine way 'D' type connector was also used for the camera USB and LX connections to the PC, and is directly mounted on the board. This keeps the internal wiring in the camera to a minimum. In the original camera design the cold-finger assembly was rather large, which meant that it was quite heavy and took a while to cool down. 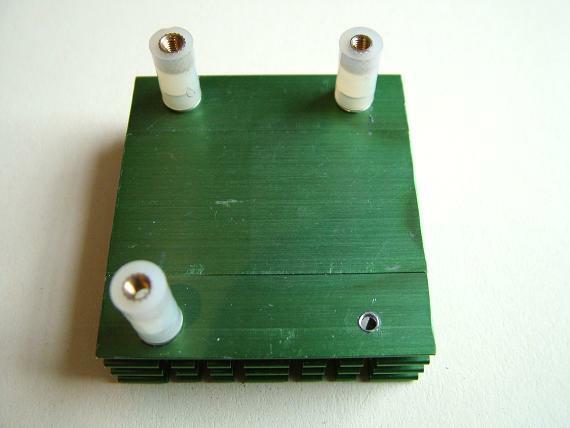 The new design has the advantage that the CCD is held in place on the PCB and the cold-finger is sandwiched between it and the Peltier / heatsink assembly. As will be seen later this means that the cold-finger is now only about 12mm x 12mm x 8mm in total and very light. 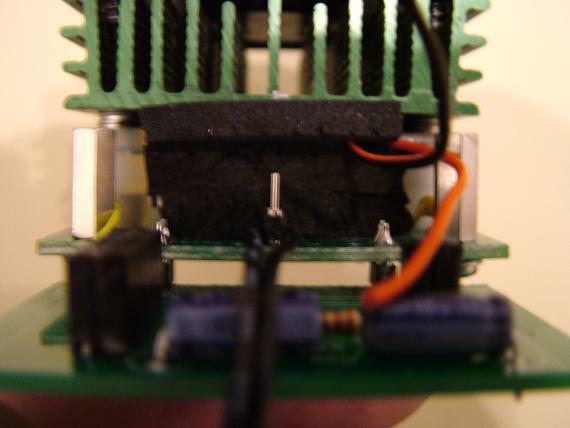 Because the Peltier device was also smaller the heatsink could also be reduced in size, which also helped to keep the weight down. 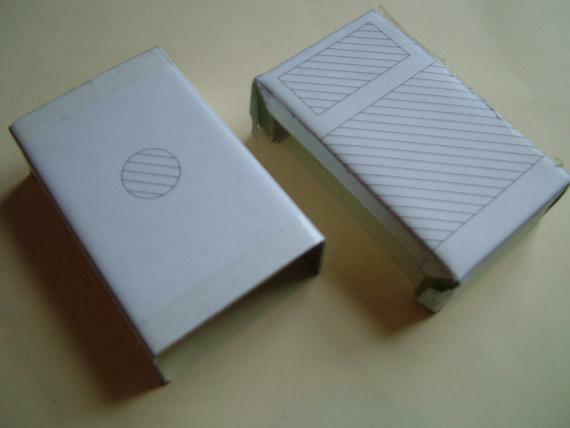 The enclosure will still be metal but will be custom made from a sheet of aluminium rather than a pre-shaped off the shelf box. Whilst this will mean more work for me to create it, it does mean that it will be just the right size and have no excess in terms of size and weight. 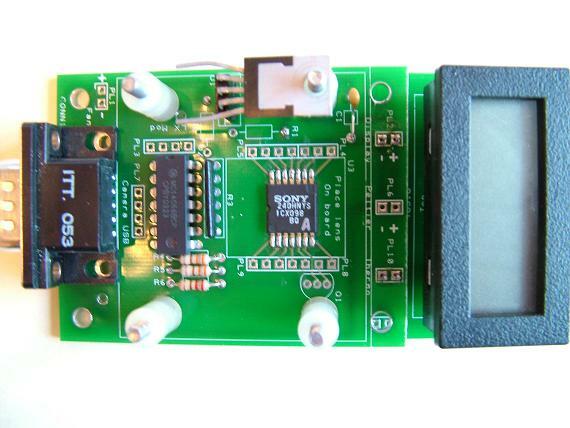 Click HERE to download the PDF file of the circuit diagram for the camera. 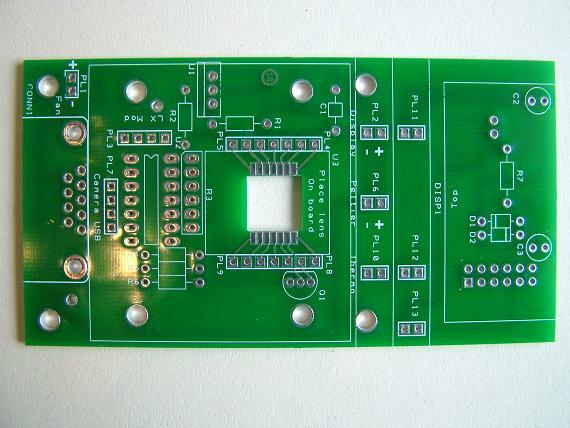 The top view of the new PCB. 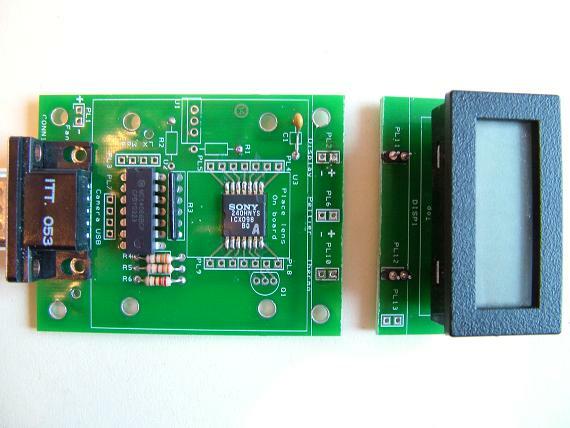 The main board and the temperature monitor board are one complete PCB to start with. 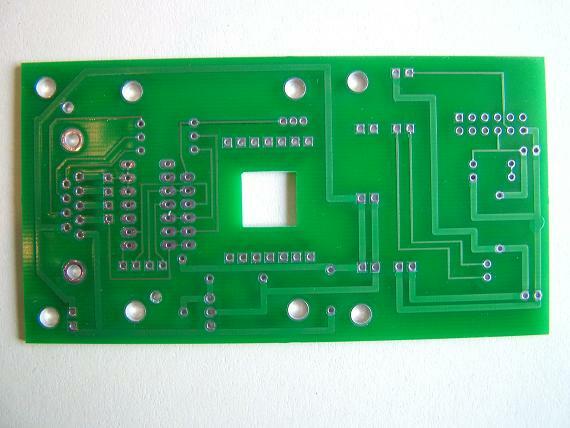 Here is the bottom view of the PCB. 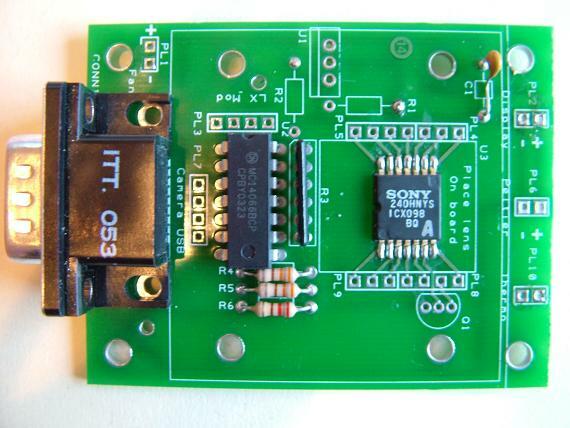 Both sides of the PCB may be downloaded as .PDF files from the end of this page. A new ICX098BQ CCD was fitted to the top of the board, but upside down (note the reminder etched on the board). Pin 1 in this view is at the top left of the CCD. The pins were straightened out and then cut to the required length. 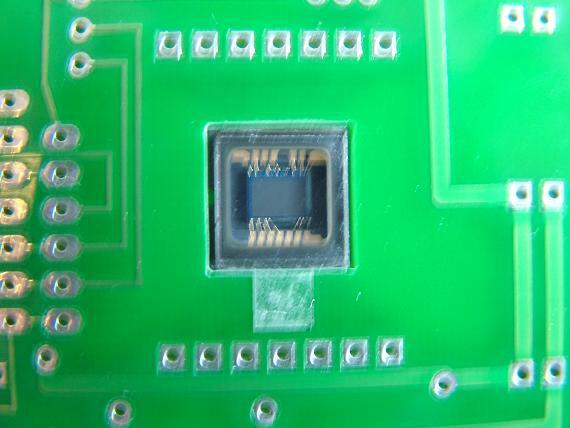 This picture shows the CCD poking through the bottom of the PCB. 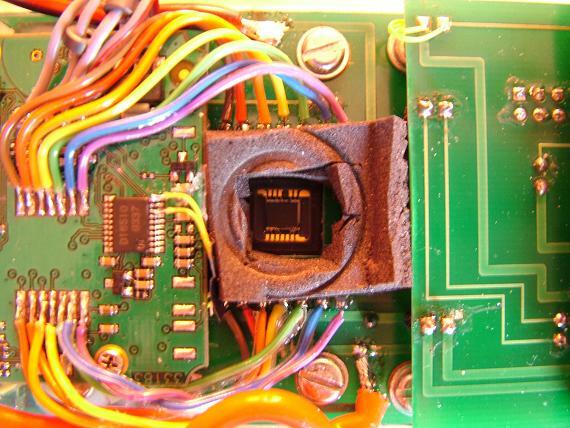 Note the protective plastic cover has been left on the CCD, and will remain in place until the project is completed, to prevent any unwanted damage to the lens. 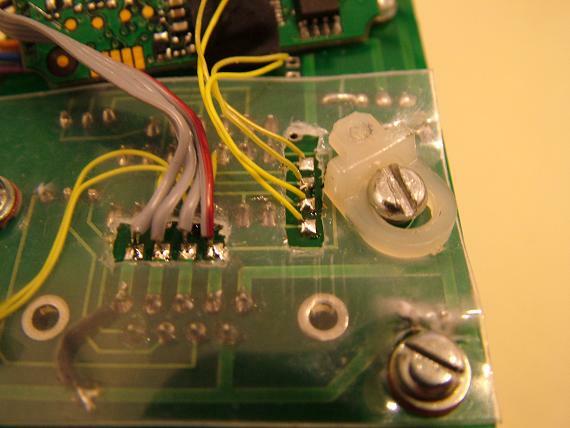 The temperature monitor PCB was cut from the main board and the components soldered to it. The 4066 quad analogue switch, resistors and resistor pack, nine way 'D' type connector and capacitor were then fitted to the main board. 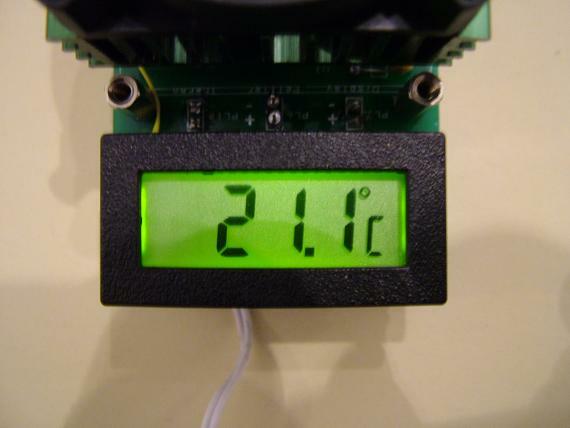 Close-up view of the temperature monitor PCB. The few components on this board are underneath the display. 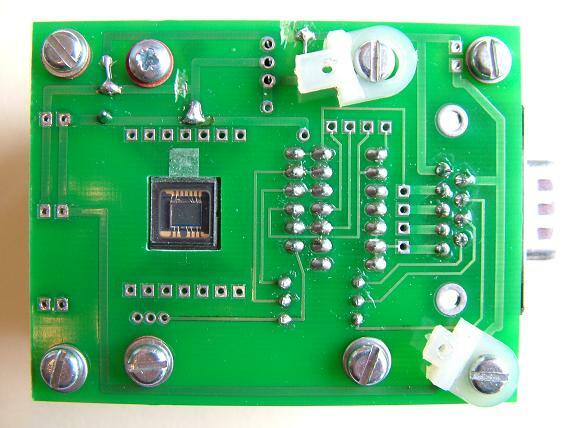 See the first picture of the blank PCB and circuit diagram for details. Close-up view of the main PCB. 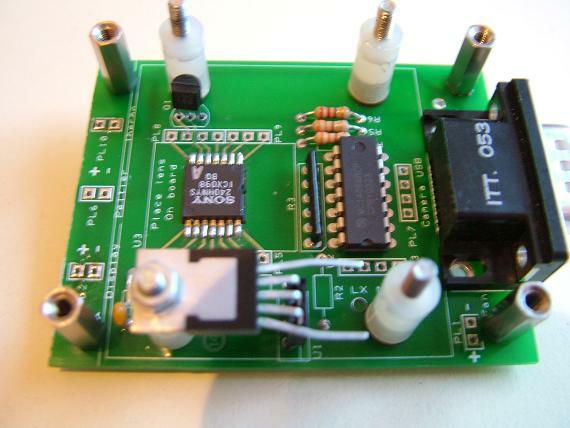 Changes to the original design mean that not all of the components shown on the PCB will be fitted. Only the transistor and connectors are now missing. 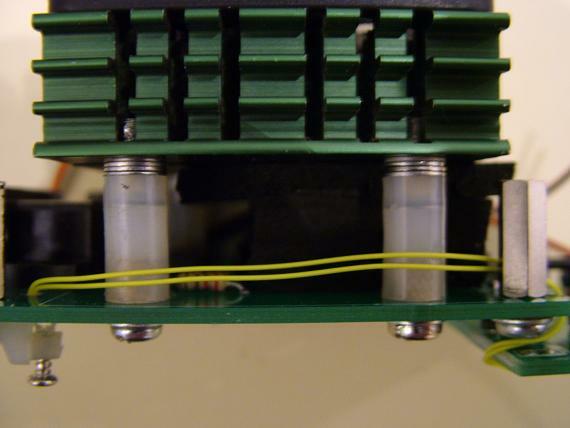 Nylon heatsink mounting spacers were used to keep the heat away from the PCB. Metal spacers were fitted to hold the main board to the case. 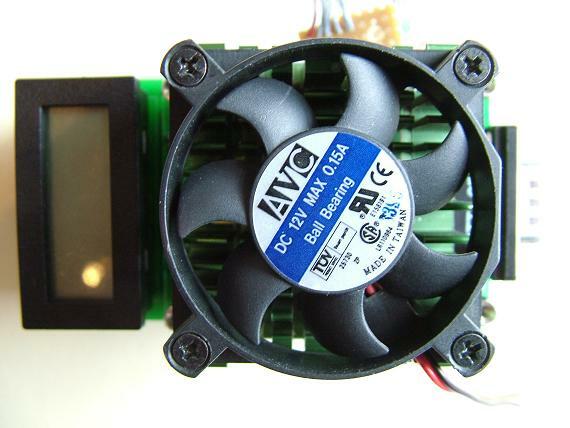 The voltage regulator shown is no longer in the final design. 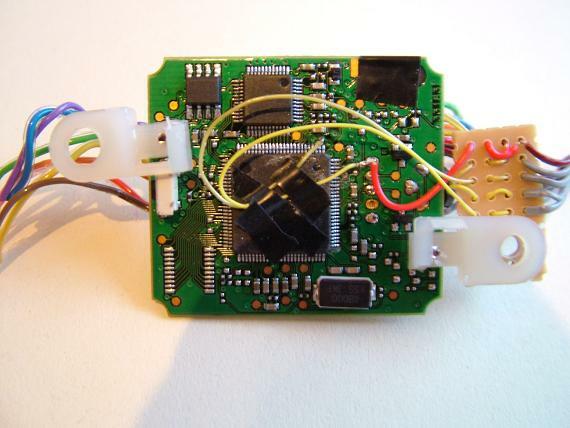 The temperature monitor PCB was then offered up to the main board, to check the fitting, using pin-strips, Maplin Electronics part number JW59P. 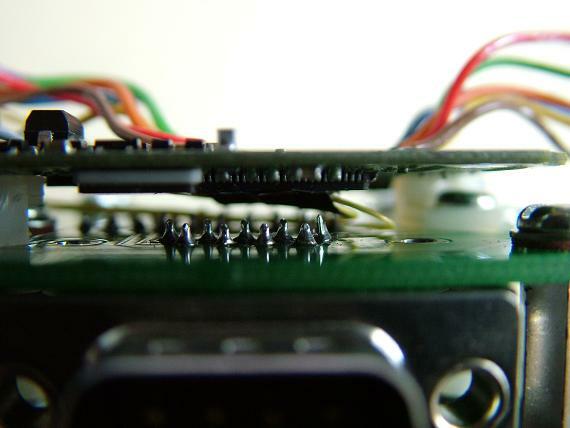 Side view detailing the pin-strips connection between the temperature monitor board and main board. 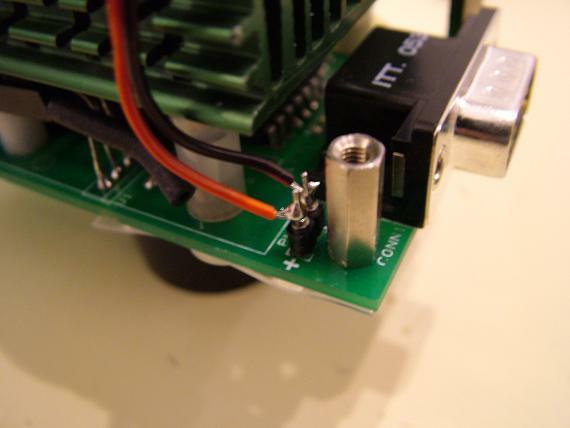 The TouCam Pro II board was removed from the original Peltier camera. 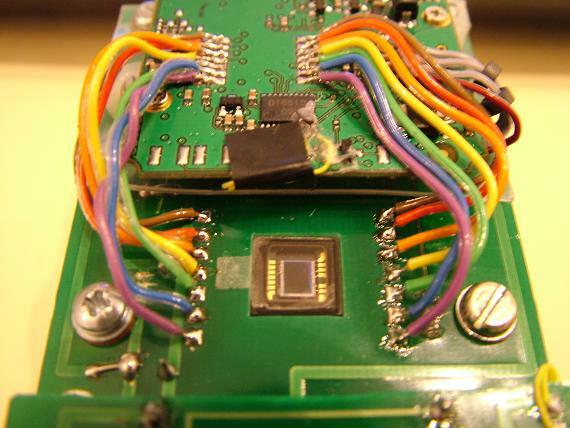 The CCD was removed from the coloured ribbon cable as it was no longer required. The plastic tie-wrap holders will be removed and re-used in the new design. 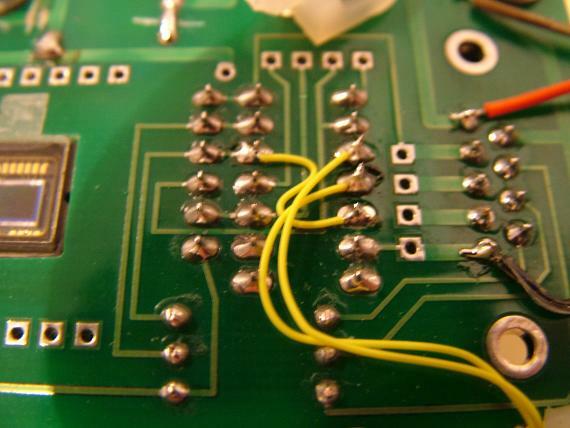 The mod wires will be removed from the veroboard as it is no longer required. I also removed the single-shot switch from the TouCam Pro II PCB shown in the picture just below the left tie-wrap holder. 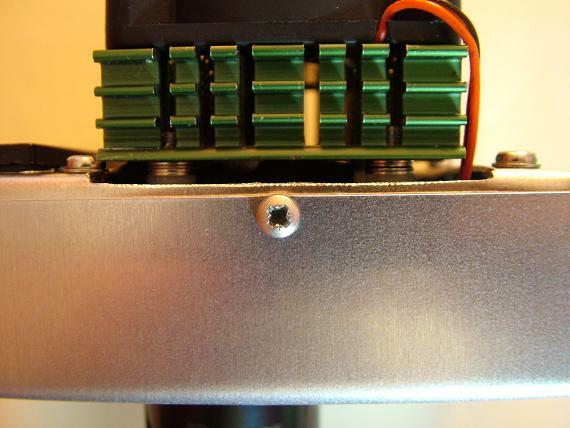 Four heatsink mounting holes were drilled and tapped to M3. The studded spacers were then fitted to the heatsink and then to the main board using M3x6 screws. The modified nylon tie-wrap holders have a small hole drilled in them. 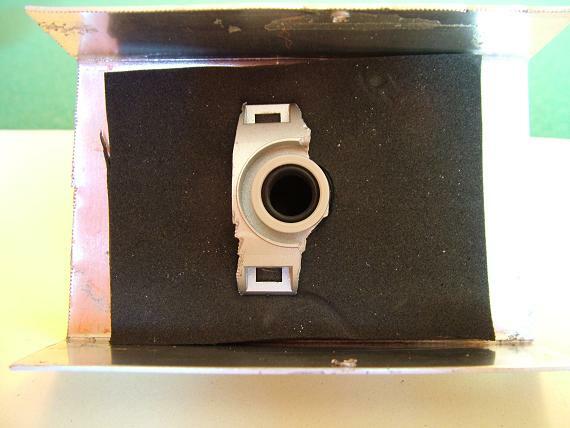 This is to hold the TouCam Pro II PCB using it's original mounting screws. 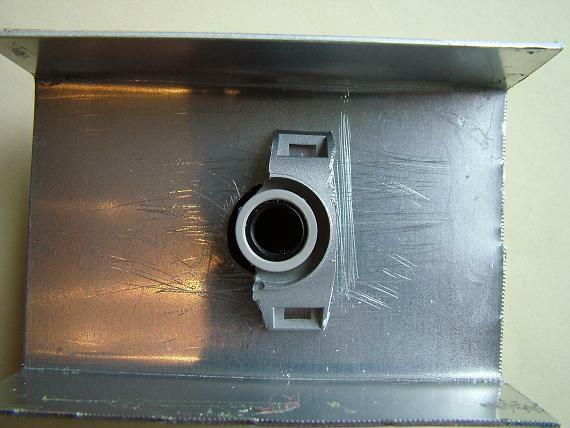 One of the tie-wrap holders is fitted using a heatsink mounting screw. 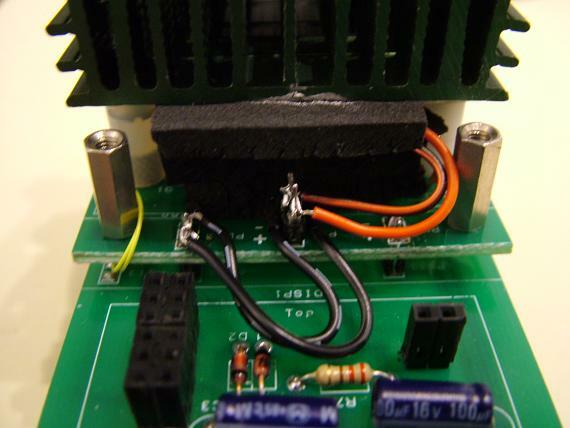 The heatsink was then fitted to the main board to test the design. 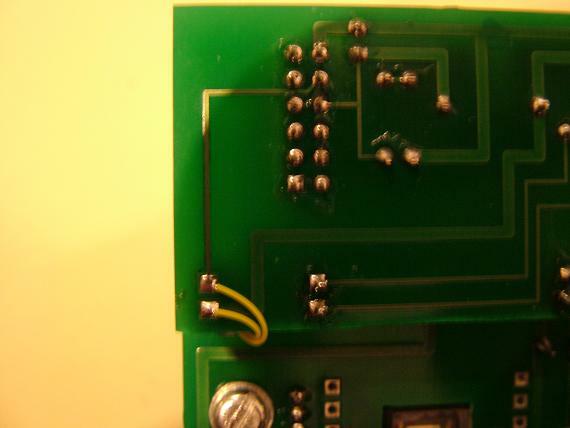 Some design changes can be seen on the PCB tracks already (and they were not the last). The space between the heatsink and CCD is much smaller than on the original Peltier camera and gives a good idea of the size of the cold finger that will be required in the final camera. TouCam Pro II PCB is temporarily fitted to the main board to check the design. I knew it was going to be tight but this is ridiculous!!! 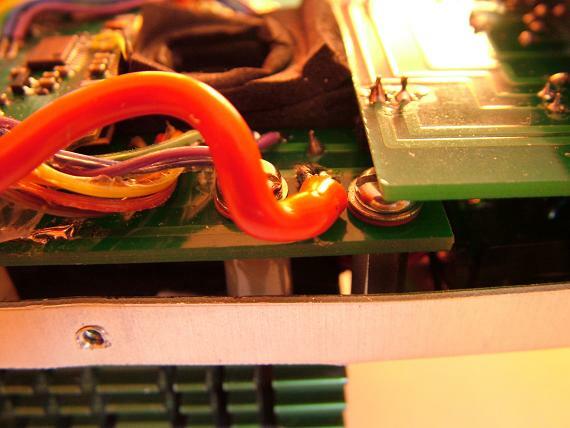 The temperature monitor PCB was next soldered into place. 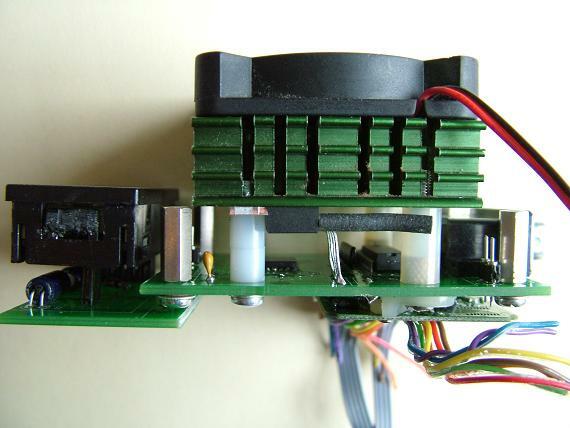 Top view of the camera so far with the fan now fitted to the heatsink. Side view of camera build so far. The other end of the analogue switch connections, on the temperature monitor board, for control of the LCD backlight. Initial testing of the temperature monitor board. All seems OK. 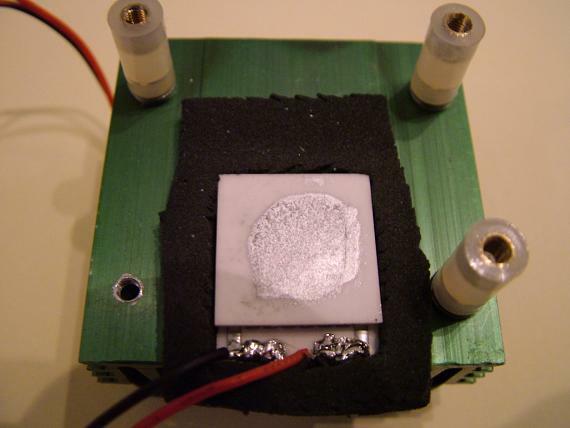 The cold-finger is much smaller, and therefore lighter and easier to cool, than in the original Peltier camera design. It has been surrounded by neoprene rubber which will keep the air away from it and help to stop any condensation forming. (We don't really want any water in here thanks). 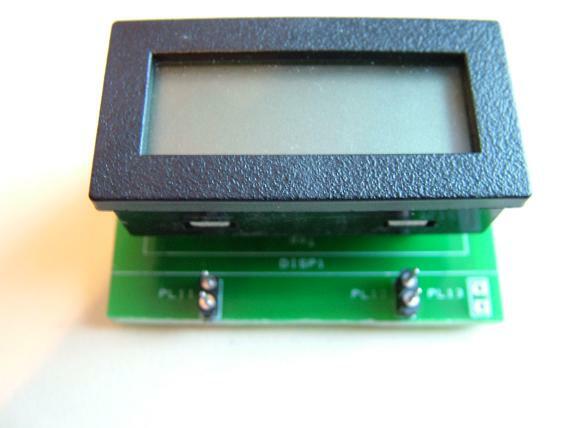 The new Peltier unit is also smaller than the original camera and runs on only +5V. 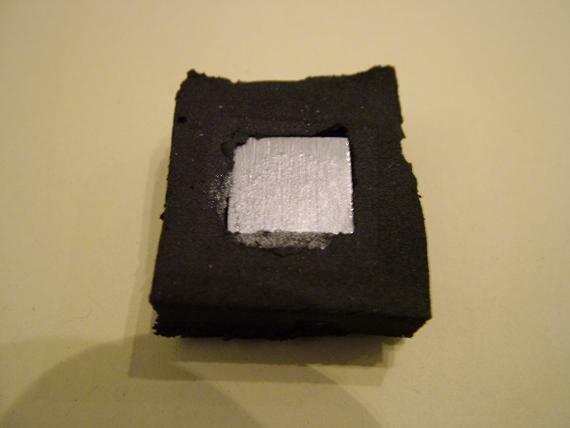 It is fitted to the heatsink with some silver compound and is also surrounded by neoprene rubber material to stop condensation forming. The temperature monitor heat sensor is fitted between the cold-finger and the CCD to give us the best reading of the temperature at the CCD. Some more silver compound is used here as well. The cold-finger assembly was then fitted to the CCD. 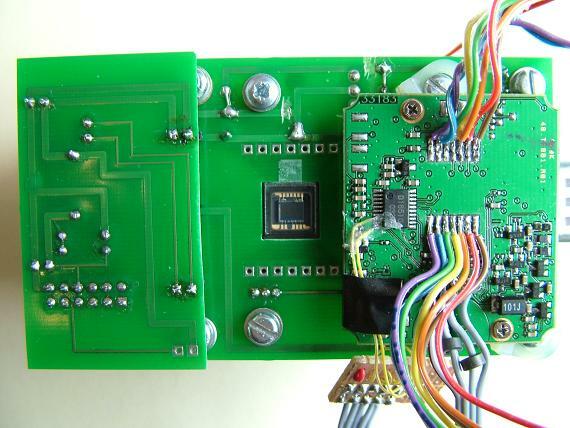 You can see the temperature monitor PCB components here as well. Next the heatsink was fitted back into place. The number of washers used on the studded part of the spacers gave just the right amount of pressure to hold everything in place, without flexing the PCB or putting undue strain on the CCD. End on view of the completed cold-finger assembly. 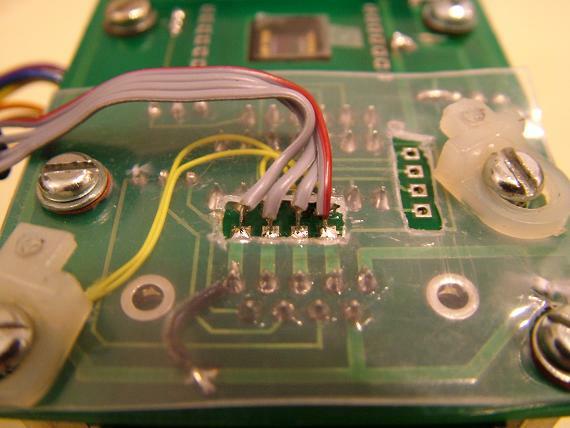 One modification was the addition of a thin piece of plastic to insulate the TouCam Pro II PCB and the main PCB. Holes were cut to allow the USB and mod wires to be connected. The TouCam Pro II fixing screws can be seen in place on their nylon holders. 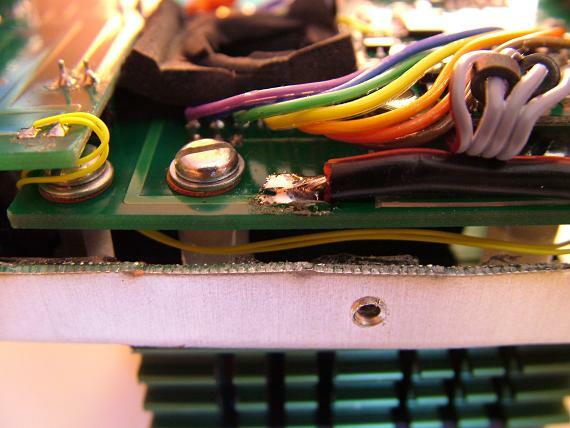 The fan wires were now attached to the main board.  As were the Peltier and temperature sensor wires. 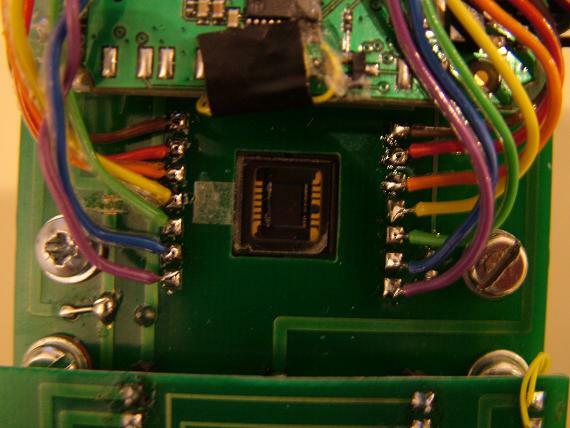 The USB wires from the camera PCB were now connected to the main PCB. And the LX modification wires followed next. 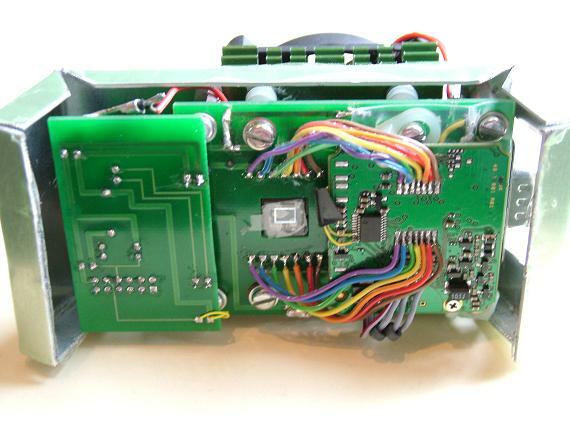 The camera PCB was re-fitted and the CCD wires connected to the main board. 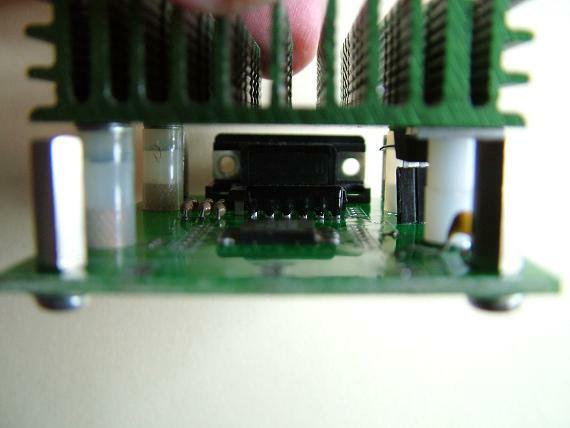 A top view of the CCD connections. The current taken by a Peltier device can be quite large. My initial testing of the unit I purchased found that it was taking 4.5 Amps!!! It was obvious to me that that sort of current should not be used in the small conductors of the cable I made for connection to the PC. 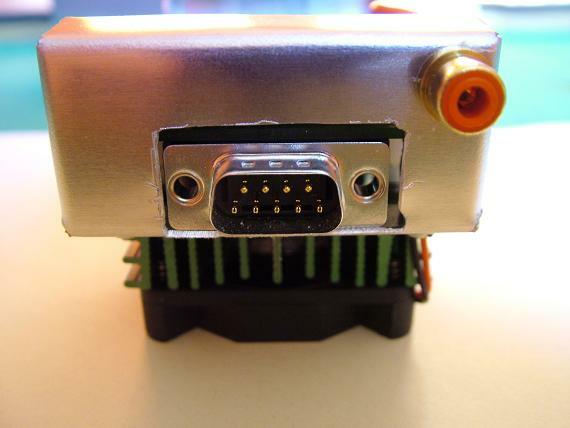 A dedicated cable was made to supply the +5V to the camera. 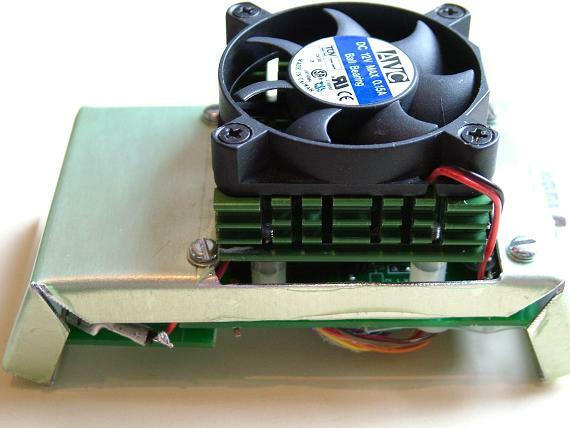 I used an old PC power supply which has ample capacity (20 Amps @ +5V) to supply the Peltier. 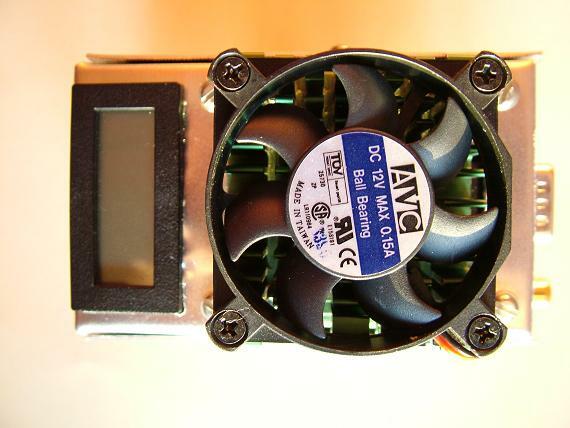 The +12V was also from this power supply but since this only ran the fan the cable I made was suitable to supply this. Having tested the cable to connect the PC to the camera I was ready to connect it all up and see the first results.  I plugged the camera USB to the laptop and started K3CCD Tools. Up came the blurred image in the preview screen. I used the original lens from the TouCam Pro II to focus on something and all was fine. What a relief. That little TouCam Pro II PCB must be a pretty sturdy design to have survived what I have thrown at it since I purchased it. The next test was to try out the LX modification circuitry. Since I knew the camera worked I was not worried about focussing on anything, I just wanted to see if the image got brighter with longer exposures. I turned off all the lights, plugged in the connector to the printer port and started a long exposure of just five seconds, then ten seconds and finally fifteen seconds. Each image was brighter than the last so I was happy that all was well. I then started some dark frame long exposures of thirty seconds to get a feel for how many hot pixels I had on the CCD. Surprisingly it seems to have very few to start with, but those it does have were quite bright. After capturing a few frames at thirty seconds exposure time, I powered up the Peltier. The results seemed excellent. Initial temperature was around 20C and it plummeted within the first minute past 0C. As can be seen the number of hot pixels is reduced in each frame. The images are a bit noisy but at least the hot pixels are being removed. 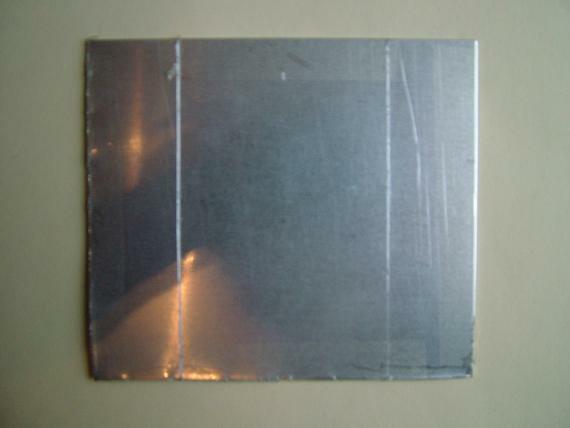 The metal enclosure is made from a sheet of 1mm thick aluminium. 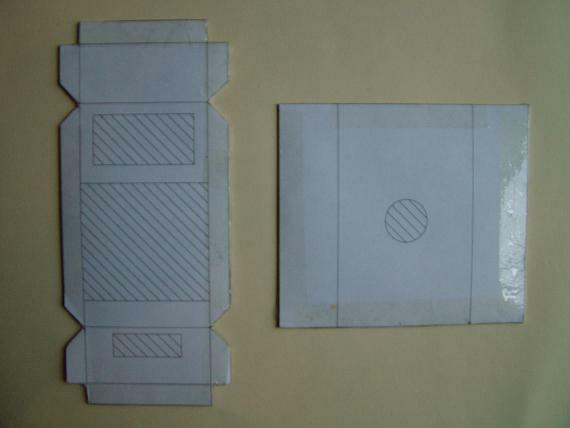 Template details were initially printed, cut out and stuck to the sheet which was then then cut to the correct shape. A .PDF file of the enclosure details can be found at the end of this page. 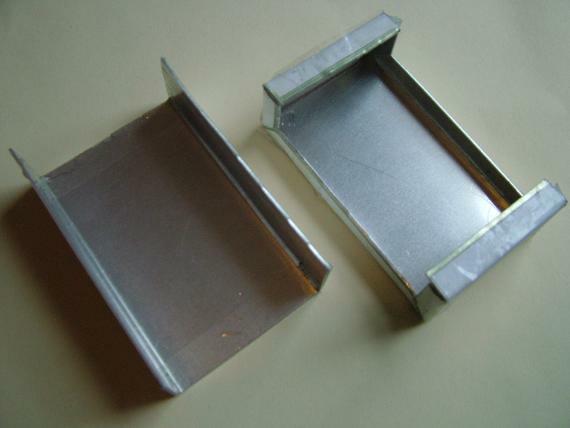 Here are the two sections of the enclosure cut out from the aluminium sheet. The other side of the parts were scored along all of the fold lines. Here is the back of the camera section showing the fold lines. Here is the front of the camera section showing the fold lines. 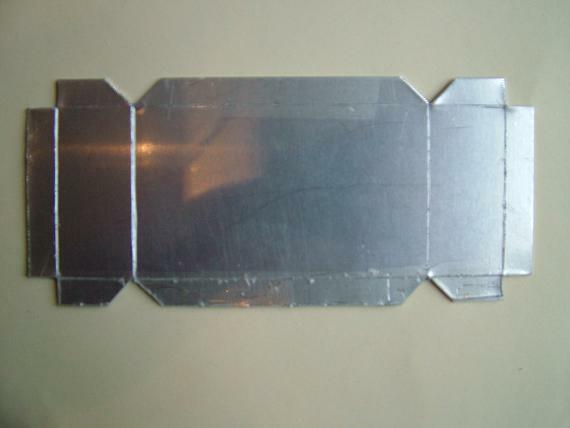 The two parts were then folded to their correct shape. An inside view of the shaped sections. The holes for both the fan and the input cable were next cut out. Four fixing holes were then drilled and the PCB's fitted into the back section. 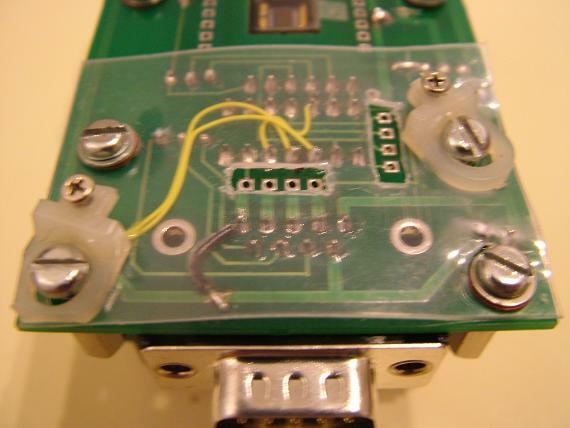 The ends of the enclosure were pulled slightly out to allow the connector to fit. 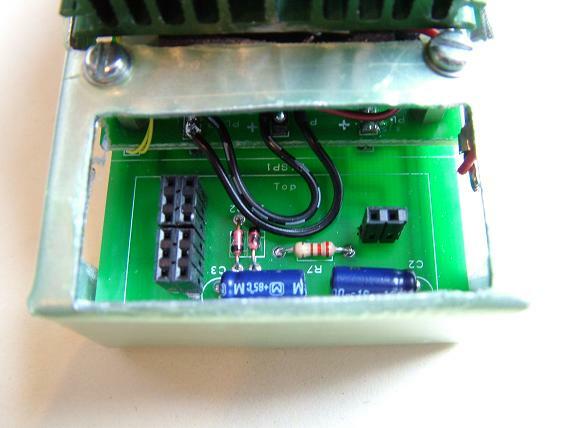 Outside view of the PCB's fitted. Next the cut-out for the digital thermometer was made. And the thermometer fitted into place. The hole for the webcam adapter was then drilled and filed to shape. The adapter was fitted using the original TouCam Pro II threaded section used for the camera lens. 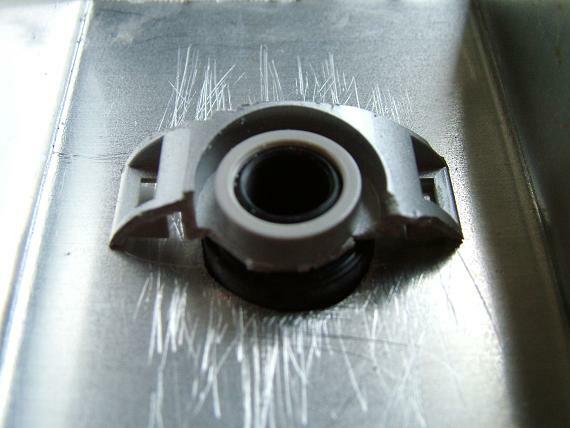 Detailed view of the cut and shaped threaded part used to hold the adapter in place. 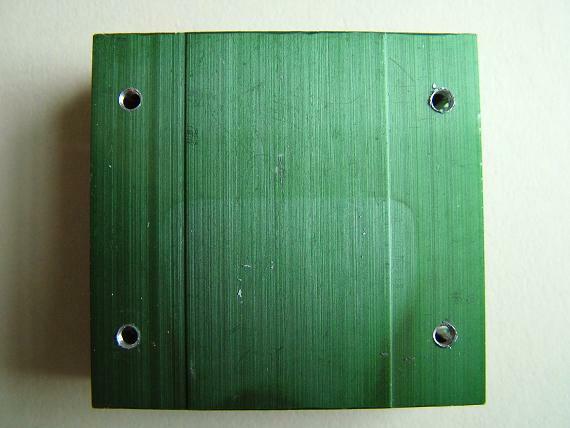 The threaded part was cut so as to avoid the CCD wires and camera PCB. 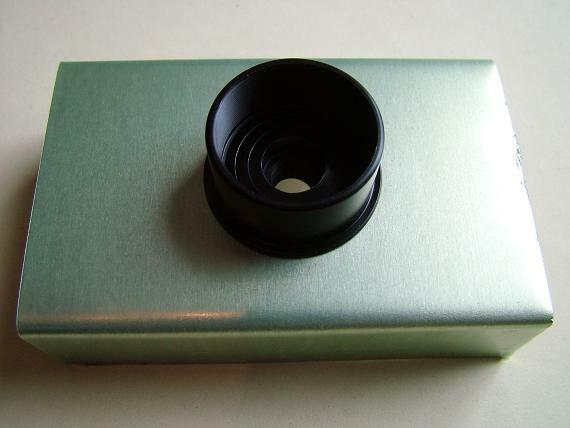 Some neoprene rubber was fitted in the gap between the CCD and the telescope adapter, to stop air from reaching them. 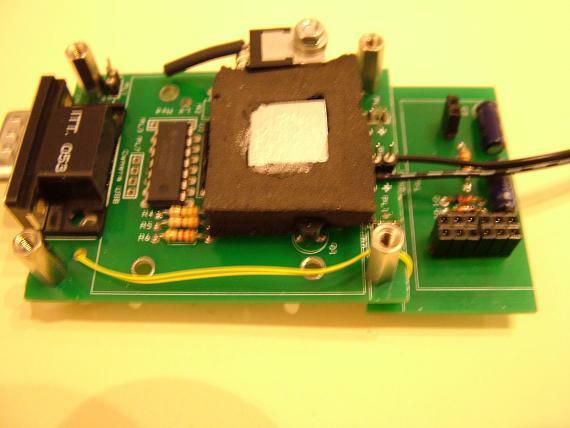 The +5V power input was reused from the original Peltier camera. 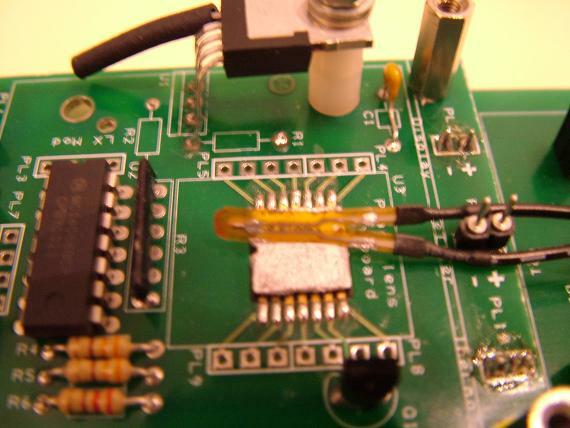 The 0V connection to the PCB. 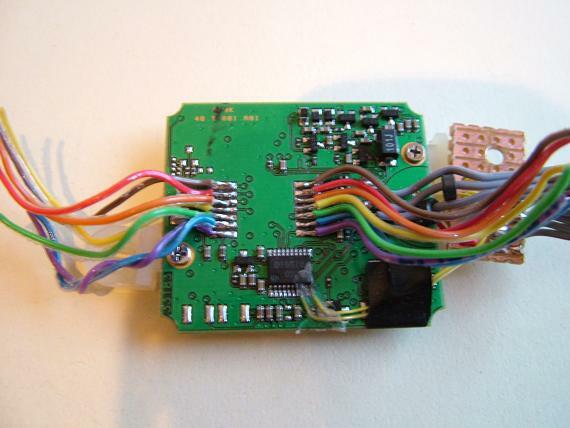 The +5V connection to the PCB. Some more neoprene rubber was fitted to the front of the camera. Self-tapping screws were used to bolt the two halves of the camera together. Cable input side of the finished camera. 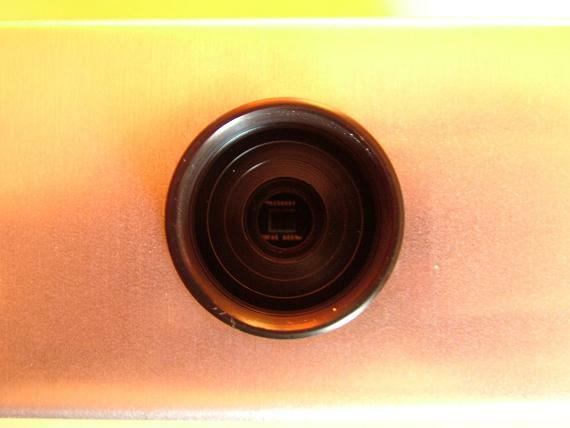 Top view of the finished camera. 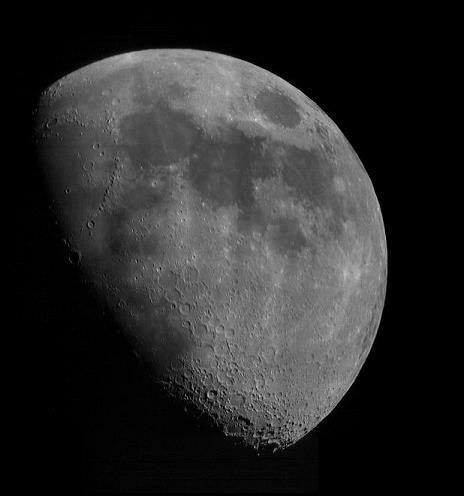 The CCD as seen through the adapter. 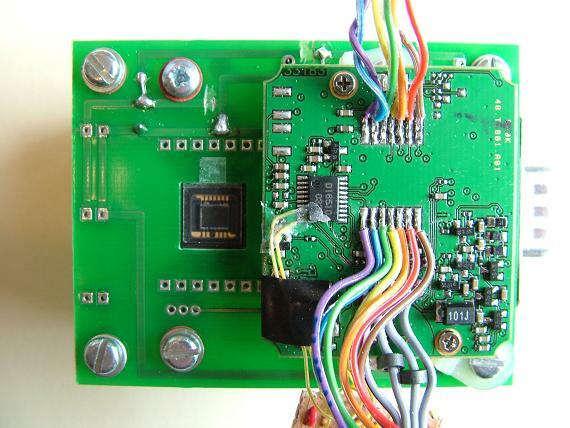 The modification to the original PCB design involved the removal of the +5V voltage regulator and associated components. 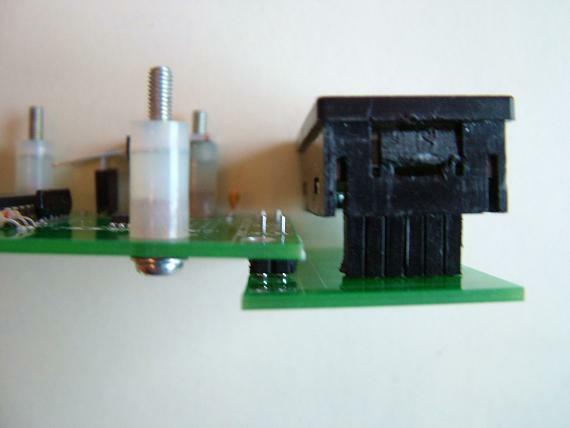 This was replaced with the addition of a direct +5V feed to supply the Peltier and the temperature monitor. 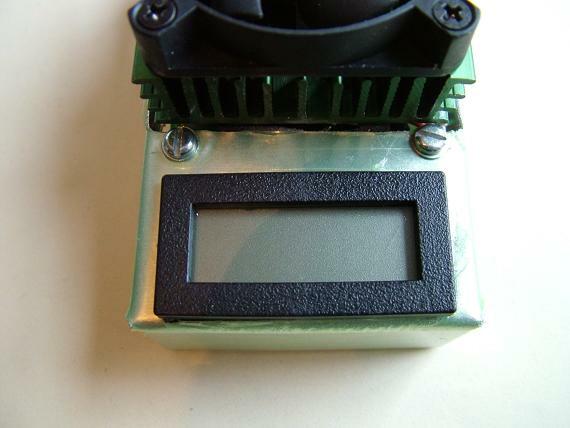 The final modification was the temperature LCD backlight control. The .PDF files below include all the modifications and therefore no track cuts or links will need to be added. Click the links below to download the track layouts, enclosure and cable details. The files are in .PDF format.  Here is the first picture I took with the modified camera. I did not use the camera cooled, but just wanted to see what the quality of a regular picture would be. The picture is a mosaic of eleven still shots made on 19/3/2005. I was quite pleased with the result but the noise can be seen at the bottom of the picture. This is as far as I have got with the project. I will update the page as I progress further.